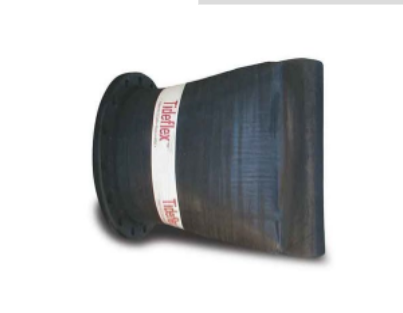 We are the official UK & Ireland distributor & stockist of Tideflex Duckbill Valves for drains and sewers. Tideflex Check Valves are cost-effective because they have a long life span and require no maintenance, unlike traditional flap valves. Consider the Tideflex track record when making whole-life cost / TOTEX decisions for your drainage asset management. Click here for a description of Tideflex Valve Benefits. If you are looking for a price for a particular Tideflex check valve, fill in our quote request form today. The choice of Tideflex valve model depends on a number of factors including location, connection design, hydraulic requirements etc. The mounting option for the same valve body shape and size has no bearing on the back pressure rating of the valve. 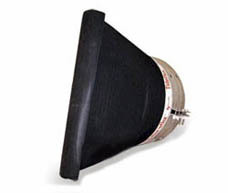 We have over 20 years practical, real-world experience with Tideflex duckbill valves. Contact us for advice and recommendations. We can provide technical information like drawings & dimensions, headloss charts, specifications and valve weight on request for projects. There are also numerous documents available to download on our site which provide more detailed information. Tideflex valve installation instructions can be found here. Find out more about our office CPD presentations or book a CPD. Please subscribe here if you want to receive our newsletters. The rubber duckbill valve is a revolutionary design for backflow prevention in drain and sewer systems for wastewater and stormwater drainage, pioneered by Tideflex as an alternative to flap valves for the US EPA. Tideflex non-return valves are the original duckbill valves consisting of a one-piece rubber matrix of numerous natural and synthetic elastomers and ply reinforcement, similar in construction to a truck tyre. These elastomeric check valves operate on differential pressure, using line pressure and back pressure to open and close, so no outside energy source is required. 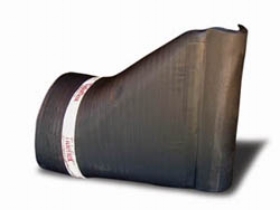 The vulcanised rubber duckbill design also means that Tideflex valves can be installed on vertical pipes. The Tideflex rubber valve has an extremely low cracking pressure - weep flow starts from 1-2 inches of differential water head - so the valve is self-draining. This eliminates standing water and maximizes storage volume (attenuation) in the upstream drainage system. The flat bottom of the TF-1 valve means that it requires less bottom clearance - this means that it can be installed at a lower elevation and thus improve the system driving head. It also eliminates the need to rotate the valve to install it; something that causes several issues and can lead to gaping. The increased bill height of the TF-1 means that the effective open area of the valve is greater and so reduces headloss and improves hydraulic performance compared to standard duckbill valves. Tideflex duckbill check valves are simple and reliable alternatives to ineffective drainage flap valves and tidal flap valves because they are constructed out of reinforced rubber. Therefore there are no moving parts that can corrode, warp or freeze. Tideflex rubber duckbill valves will handle large obstructions without jamming, and there is no gate to be stuck open or closed. This provides peace of mind for stormwater and combined sewer overflow systems designed to provide flood protection for low-lying areas. Tideflex check valves are self-clearing of debris and seal tight around obstructions, which makes them an excellent choice for use as a tidal valve on coast / beach outfalls, river outfalls, marine outfalls and in floodplains. This also provides significant savings for sewer systems and treatment plants affected by saltwater intrusion. Since Tideflex duckbill valves are normally closed, only opening with water differential pressure, they discourage unauthorised access to outfalls, especially on larger sizes. They are also silent in operation and there is no banging as experienced with traditional flap valves. This makes them ideal backflow prevention valves. Tideflex non-return valves are available in asymmetrical (flat bottom) and inline (CheckMate) models for easy retrofitting to existing drainage systems without requiring any modifications. Non-standard sizes can be manufactured on request with the smallest possible being 12mm. The curved bill is more resilient than the standard straight bill, reducing headloss across the valve and increasing the sealing area by 50%. Drainage systems need to be reliable in the long term and meet the design intent 100% of the time, no matter the weather. Don't accept second-best when you cannot afford the consequences. We stock valves made of Neoprene with EPDM wrapping, but other elastomers are available on request for various applications. Neoprene offers excellent resistance to a wide range of effluent substances encountered under general operating conditions, including hydrocarbons, fats, oils, grease, kerosene and methane, while EPDM is chosen for its robust abrasion and UV resistance. Tideflex also produce valves for clean water/potable water use with NSF certification. Tideflex check valves have been exposed to extensive independent hydraulic testing since the 1980s and continue to be improved through research and development and ongoing in-house testing along with field studies to validate long term performance. These tests along with Finite Element Analysis modelling have formed the basis of the hydraulic characteristic curves used to design all Tideflex valves to meet the different scenarios and applications presented to us by our clients. Let us assist you in writing a strong technical specification to ensure you get the product you intended in your design.